Preston North End are being linked with a move for Barnsley striker Kieffer Moore. Alex Neil is in the market for a target man and the towering 6’5” 25-year-old would seem to fit the bill. 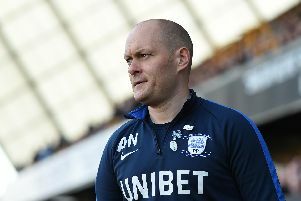 But according to reports in the national media, while PNE did show an interest they were not willing to meet the Tykes’ £2 million valuation for a player who only joined them in January. Moore scored 13 goals in 22 League One games for Rotherham while on loan from Ipswich in the first half of last season. He was then snapped up by Barnsley for a reported £750,000 and scored four times in 20 Championship appearances as the Yorkshire club were relegated. Now they face a battle to keep hold of one of their prize assets with a number of clubs seemingly interested in Moore but the Tykes will be hoping he can recapture the form he showed at Rotherham as they look to bounce back to the second tier at the first attempt.